Some disasters are bigger than others. But no matter how big the disaster gets, our team is trained and equipped to handle it. So if you experienced a large loss in your home or business, give us a call. No matter what time your disaster happens, you are going to want a quick response from a team of professionals that will do the job right. We are available 24 hours a day, 7 days a week to take your call. 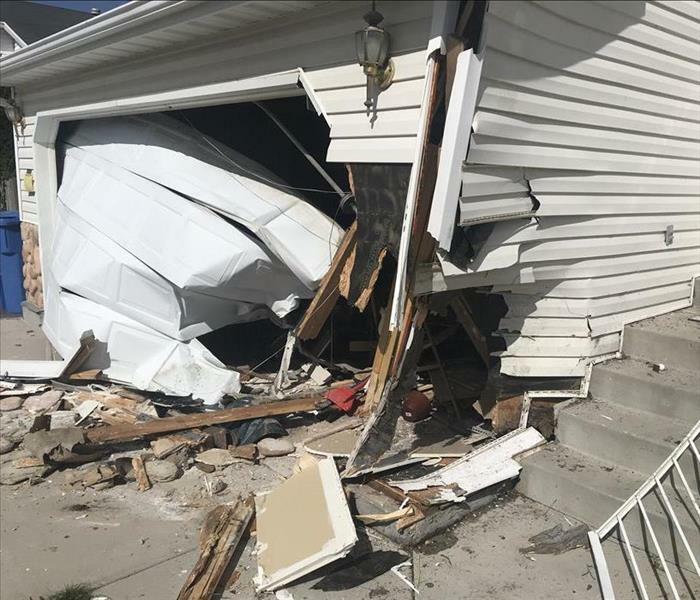 This home was damaged when a car crashed into it. We were able to protect it through the use of our board up services. We can help you too if you find that your home has been opened up due to a disaster. 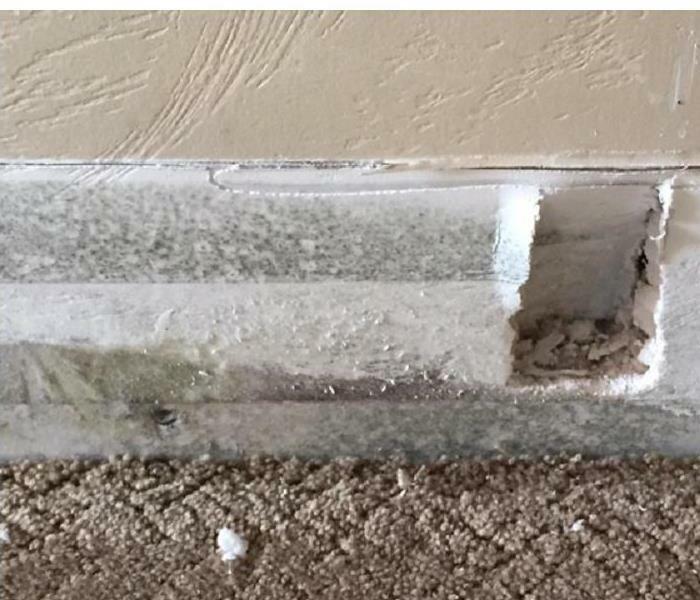 This home developed a mold problem that affected multiple surfaces, including this door, when a moisture problem went unnoticed for a short time. 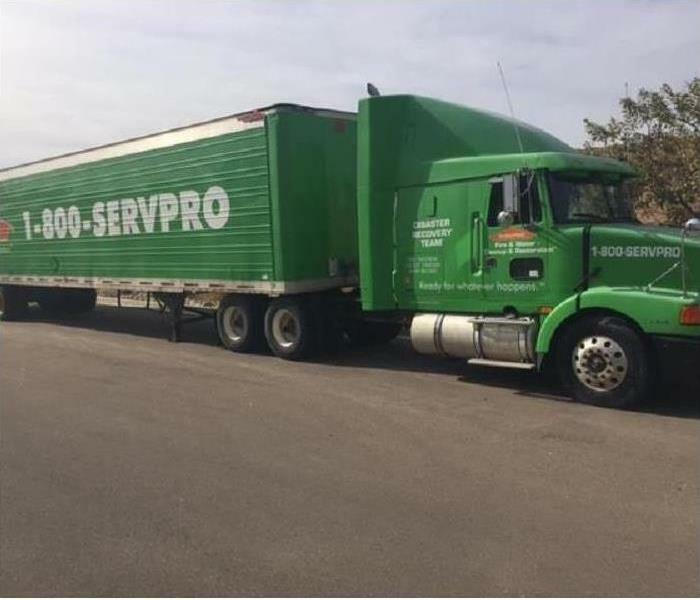 If you have a mold problem, call SERVPRO. We are faster to any size disaster. 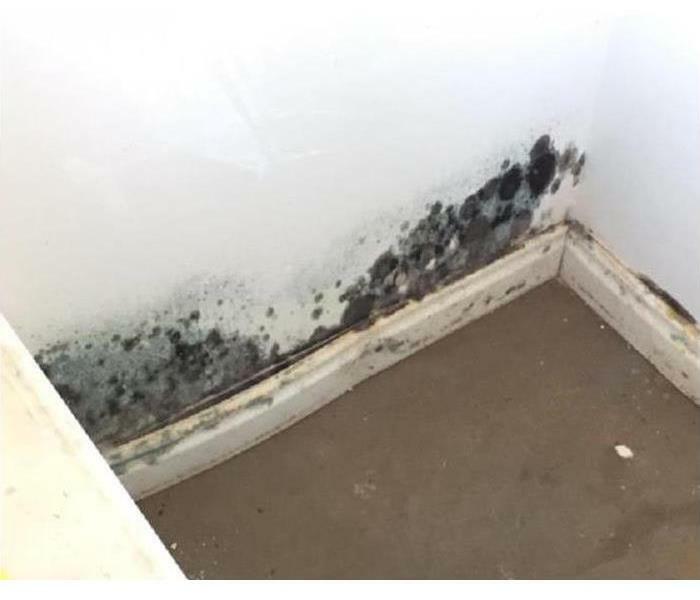 The only real way to get rid of mold in your home is to remove it along with the moisture problem that is at the root of your mold issue. 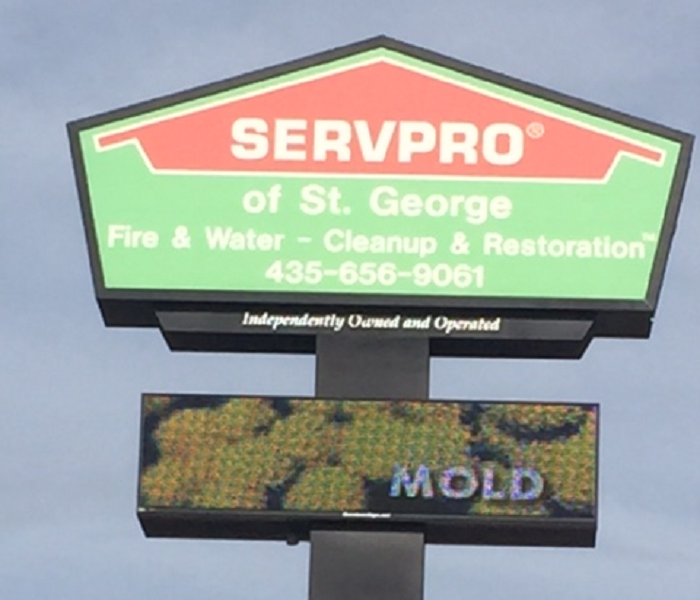 If you have mold, call SERVPRO! We want to make sure the uncontaminated portions of your home stay that way while we make repairs after a water or mold loss. For that reason, we use containment barriers like the one pictured here. 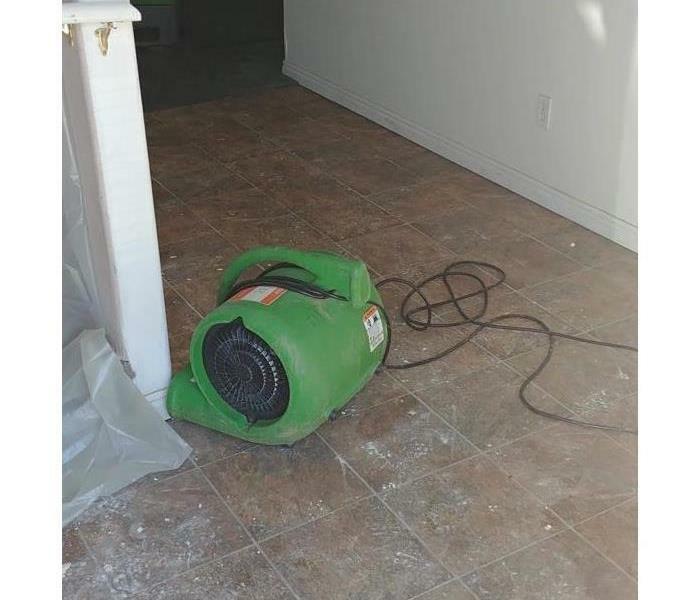 In order to cause moisture to evaporate quickly, we often use equipment such as this air mover in conjunction with other equipment such as air scrubbers and dehumidifiers. If you have a water loss, give us a call! When moisture goes too long without being addressed, secondary issues such as mold can occur. That is why it is critical to dry the moisture as quickly as possible. That is why we use equipment like this. This home was flooded due to heavy rains that caused a stormwater intrusion, as you can in this image. When we arrived, there was still water standing in the floor. If you have this issue, give us a call! 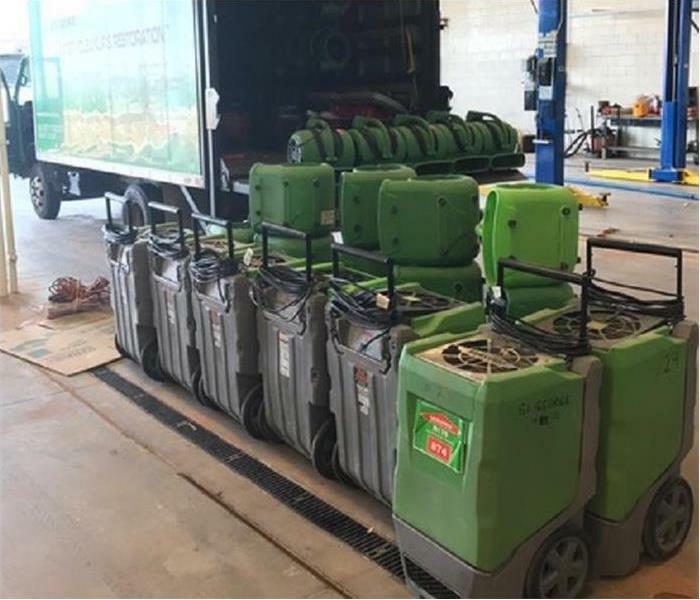 We will often use equipment such as dehumidifiers, HEPA filtered air scrubbers, and air movers like the one you see here to help speed up the drying process after a water loss through a balance between evaporation and dehumidification. 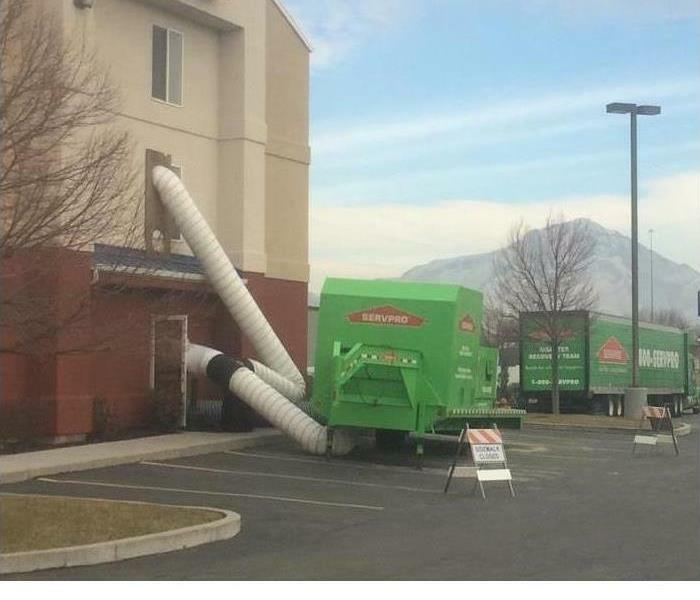 SERVPRO of South Jordan responded to this large loss after the facility gave us a call. They knew that we had the capabilities to fix their flooded building. 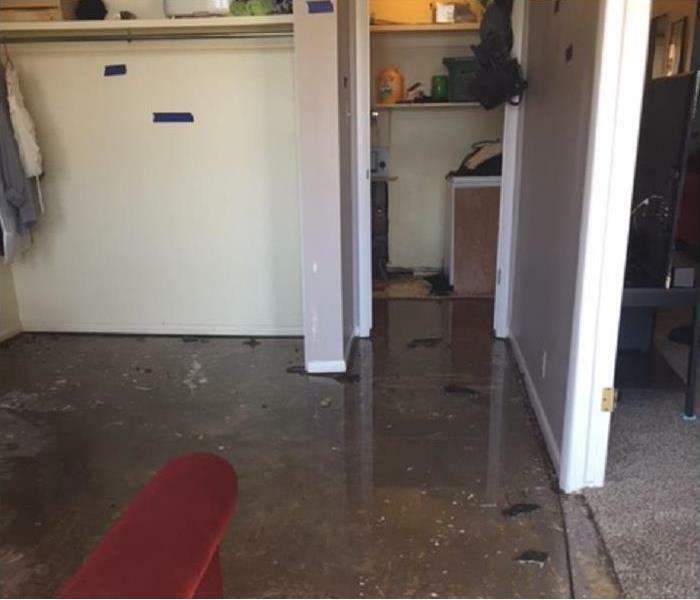 The heavy rains in Salt Lake City caused the flooding on the basement floor. Why should I call a professional restoration company? 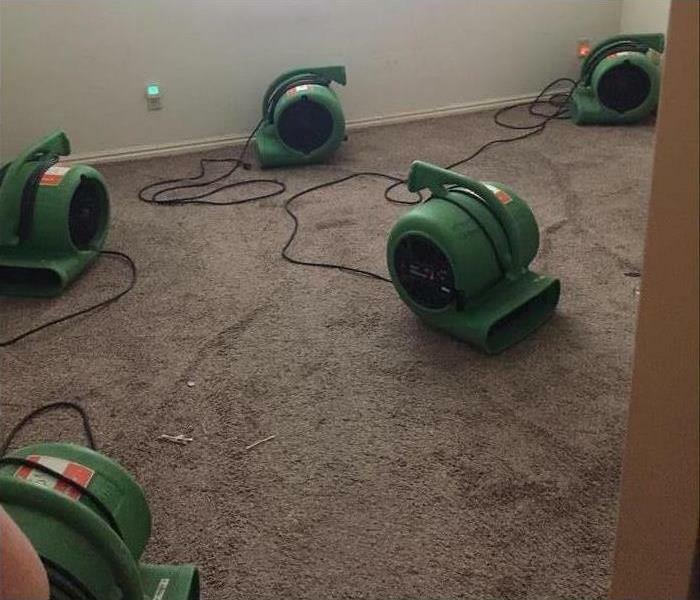 When it comes to water damage their are some important considerations. The most concerning is mold growth. When water sits for more than 24 hours there is a higher chance that mold will grow in wall cavities. We are ready any time to be there for you if your business suffers a loss. 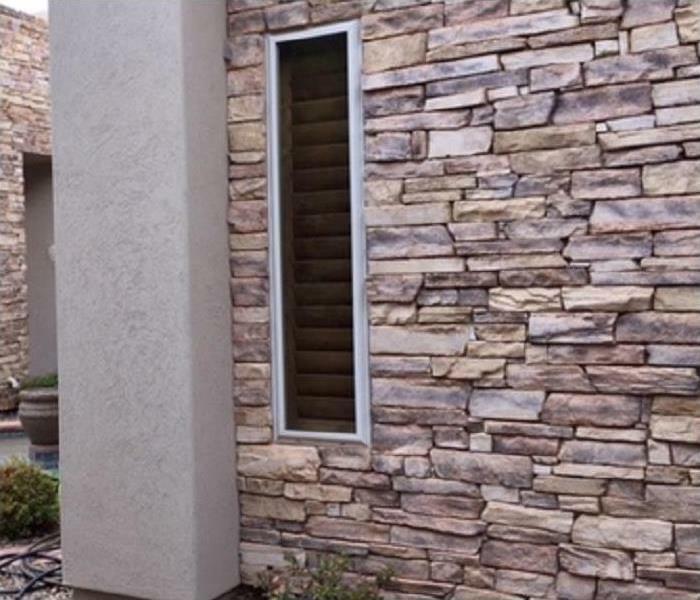 From storm damage to fire damage and everything between, we can handle it. When disaster strikes, give us a call. We'll make it "Like it never even happened." 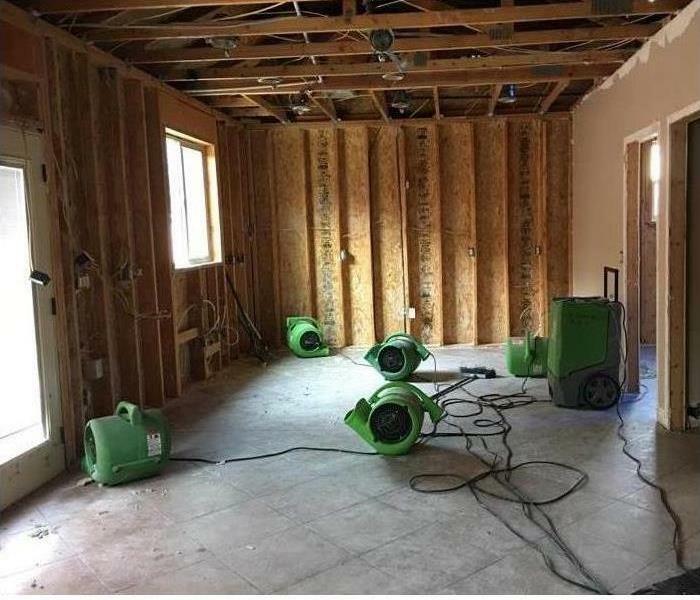 If your business suffers a loss, such as the water loss the business in this picture experienced, you need a team of professionals to help mitigate the damage. Call us. We are faster to any size disaster. 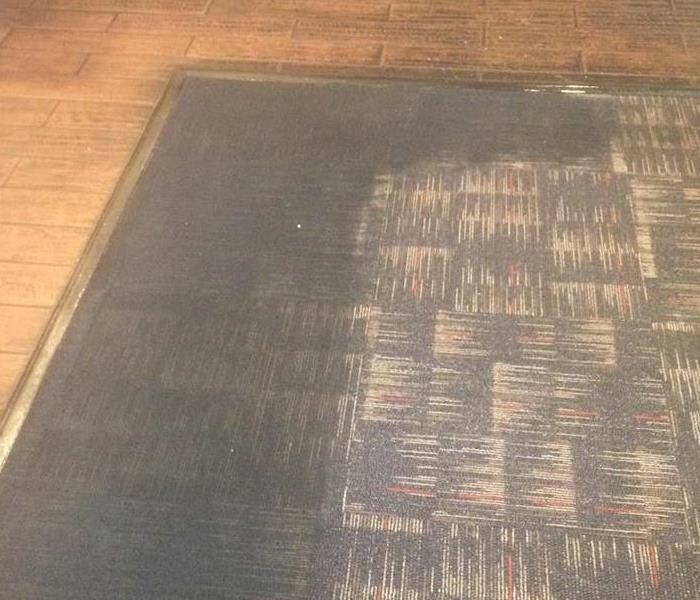 Several rooms in this hotel were affected by a large water loss situation. We came in and removed all the water and removed all affected sheetrock and carpeting. We repaired the damage quickly. 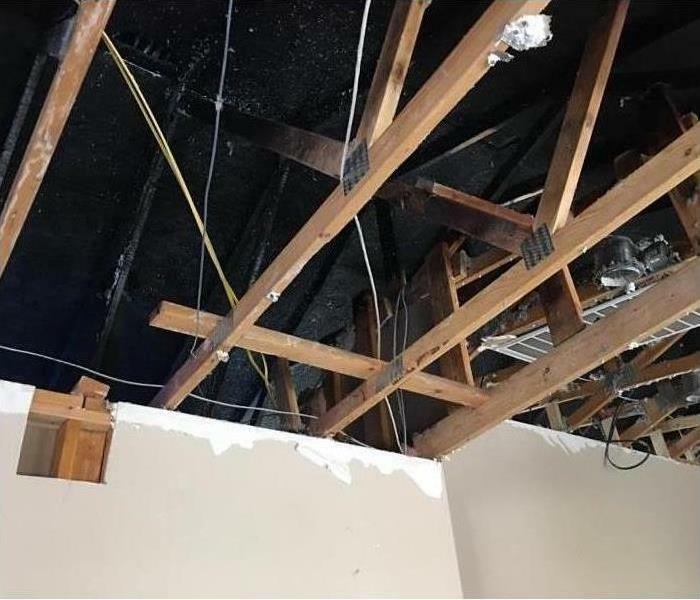 This facility was damaged by water as a result of a broken pipe that flooded the interior. There was still standing water inside the facility when we arrived but we were able to quickly repair the facility. When this owner called us, we were told a quick response was crucial. We delivered on that response and our turnaround time was better than the owner expected. He was very happy. 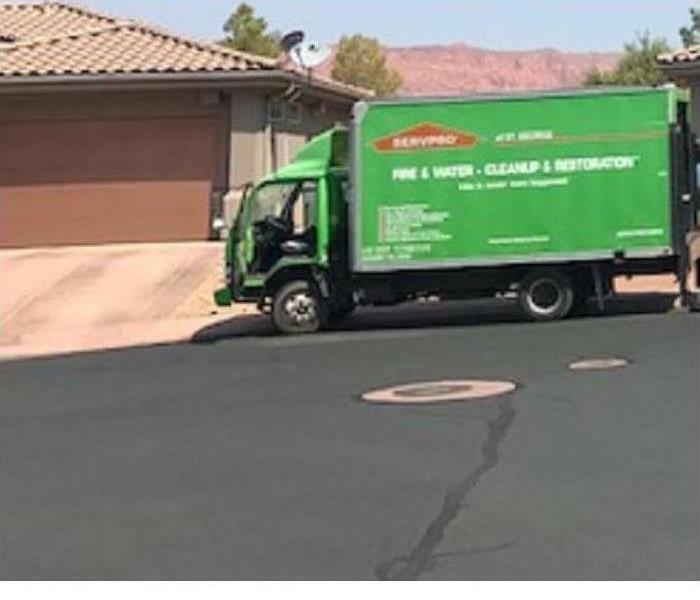 This equipment and this truck are ready to go to a commercial facility that suffered a very large water loss. 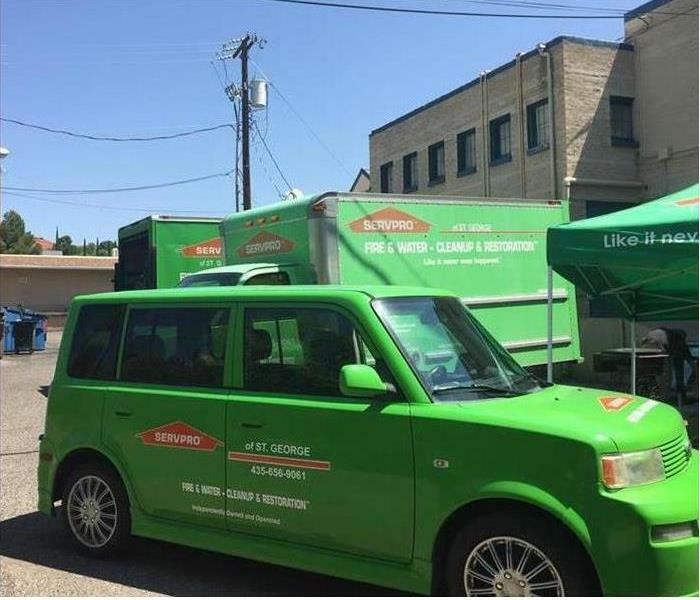 Our team is always prepared and ready to go when you need us. We are faster to any size disaster. The home in this picture suffered a heavy fire loss and needed to be remodeled. As you can see, this picture was taken post demo. 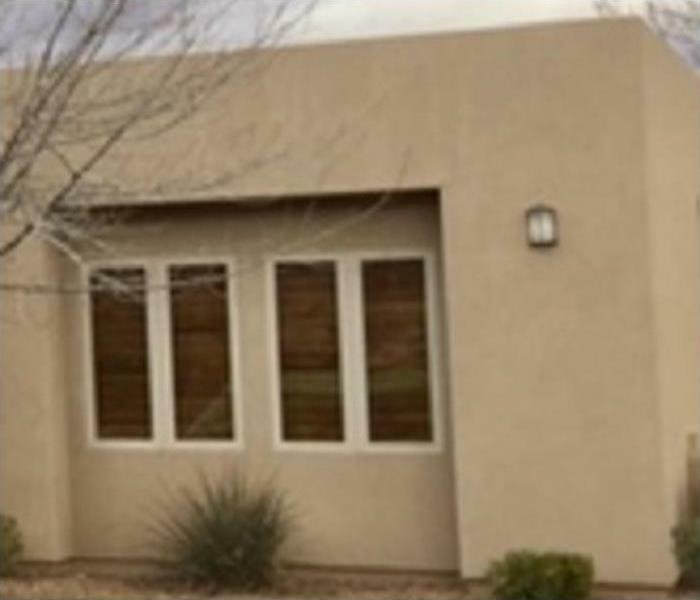 We were able to repair all the damage and restore this home to its pre-fire condition. The wall in this picture had a moisture problem that caused the mold you see to develop. We performed a wet check to find the moisture and once we found it, we removed it and the mold and repaired the damage. This home had a mold loss situation and we were called to repair the damage. The first thing we did was to put containment barriers in place. We then brought in all the necessary equipment to deal with the mold and the moisture. 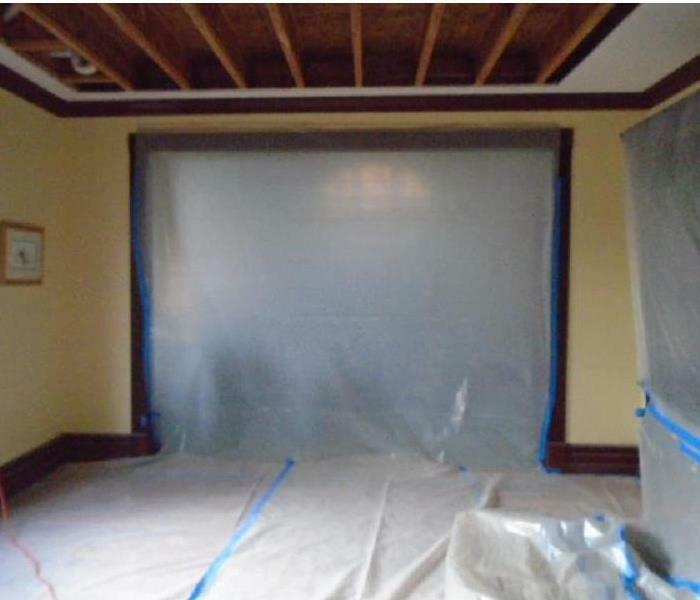 This home had a serious mold problem that resulted in the mold you see on the wall in this picture. We found and removed all the moisture and the mold and repaired all the damage. 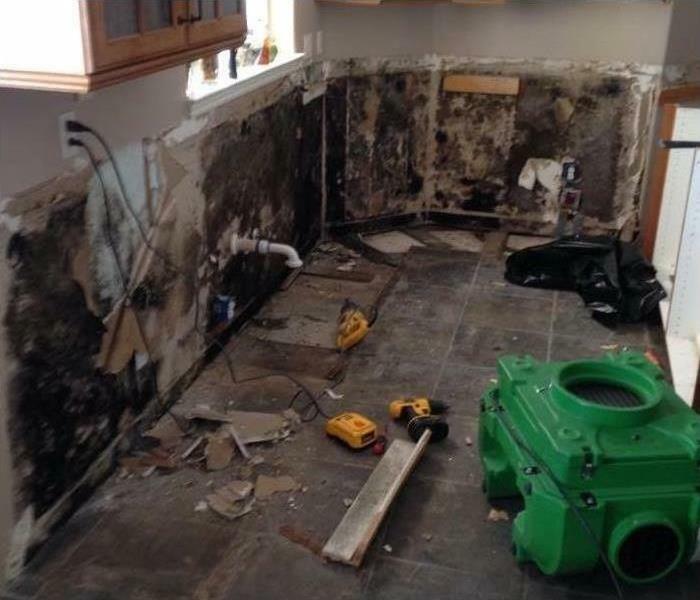 When you have mold, it can be difficult to deal with. When it happens, you need an expert to help remove the mold. Our highly trained team of professionals are ready and equipped to make it "Like it never even happened." 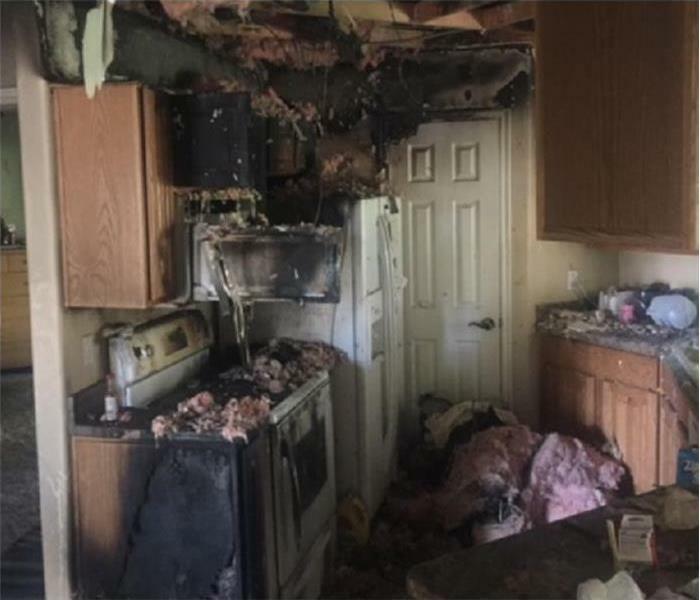 A large fire damaged the kitchen in this picture. It started on the stove and got out of control quickly. Notice the extent of the damage. We came in and cleaned up all the damage and repaired it faster than the owner expected. 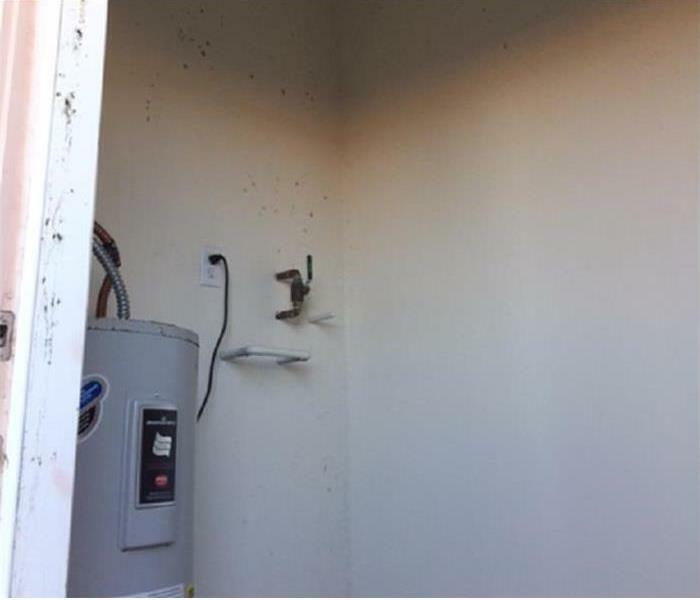 The mold in this picture was caused when this water heater leaked. After the water heater was repaired, we were able to clean up the moisture and the mold. We repaired all the damage quickly. 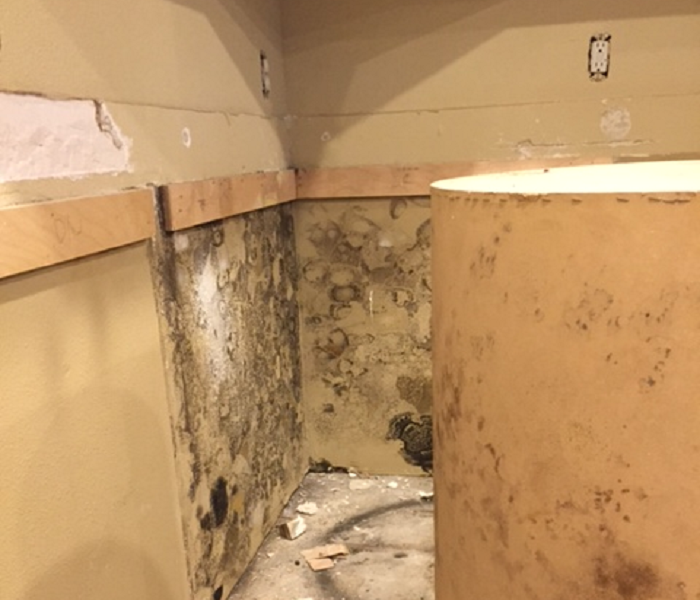 A moisture problem in this kitchen caused the mold that you see in the picture. We pulled out the cabinets and found this mold. We removed the mold and the moisture and repaired all the damage. A fire that affected this home did serious damage to the roof as you can see here. 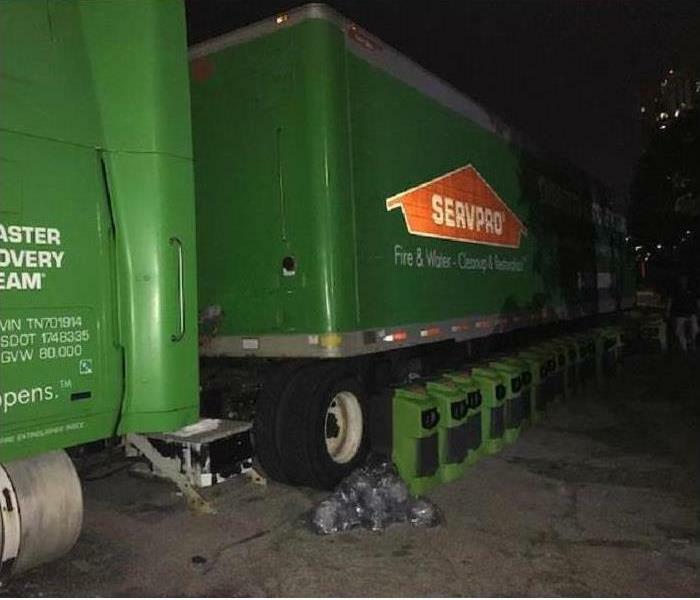 We were able to clean up and repair the damage quickly. If you have fire damage, call us. We'll make it "Like it never even happened." We want to take care of your things. 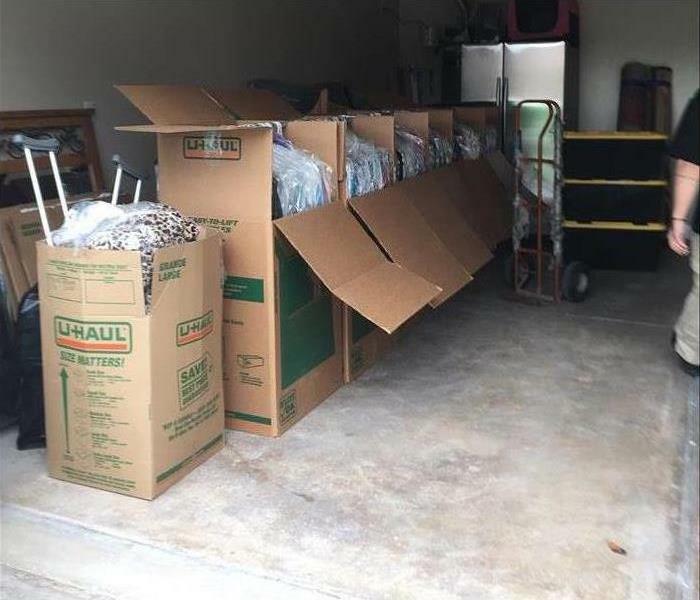 That is why we are equipped with what we need to pack out your items as you can see in this image. 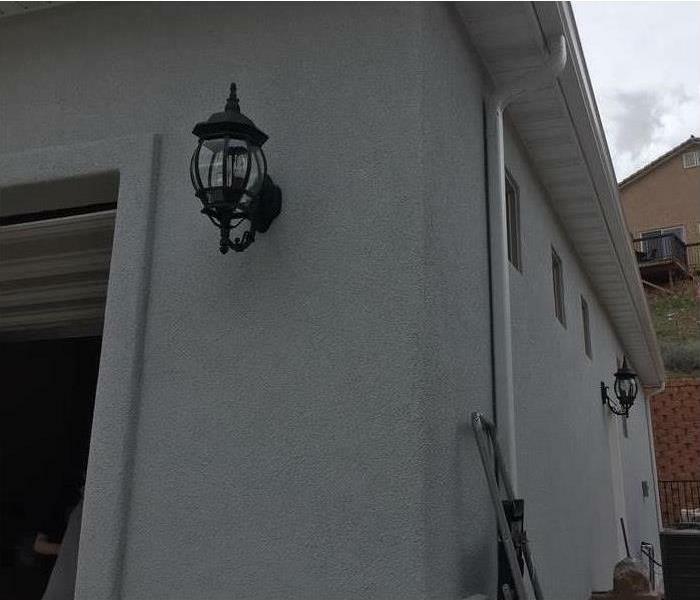 After packing out this home, we were able to remediate the fire damage to this home. 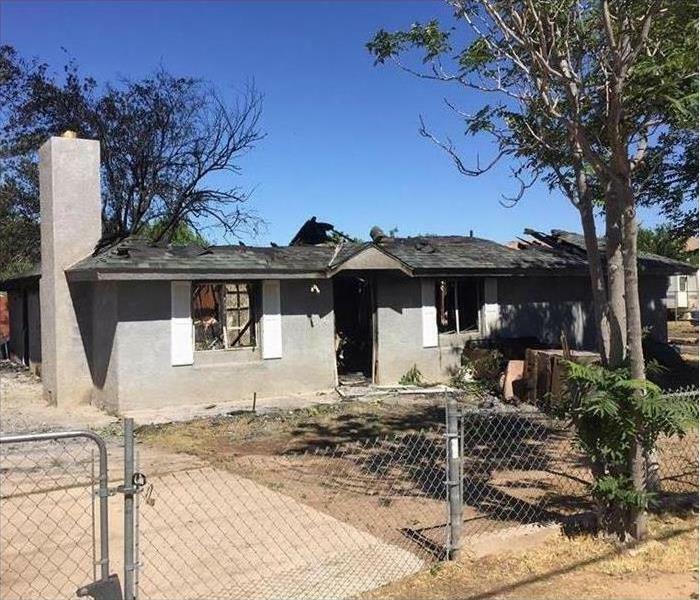 This home had a fire that affected a large portion of its interior. When a fire strikes, it can cause large amounts of damage in a short amount of time. If you have fire damage, call us. 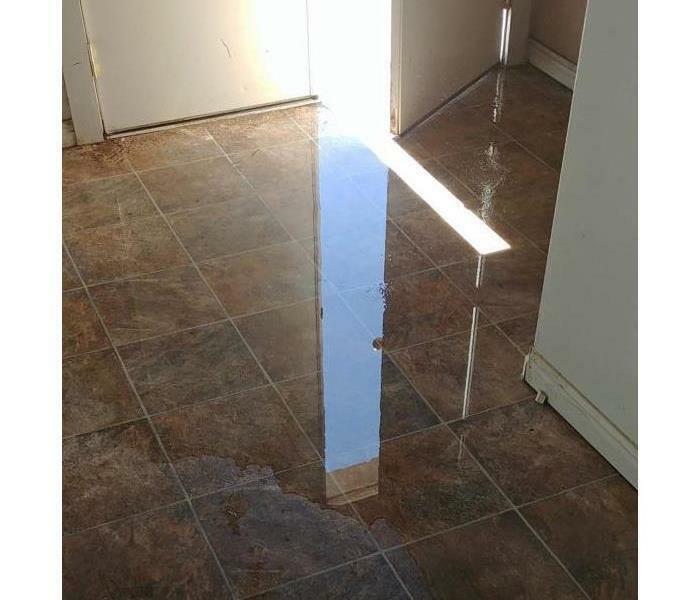 This office had a water loss that was caused by a toilet leaking in the adjacent bathroom. 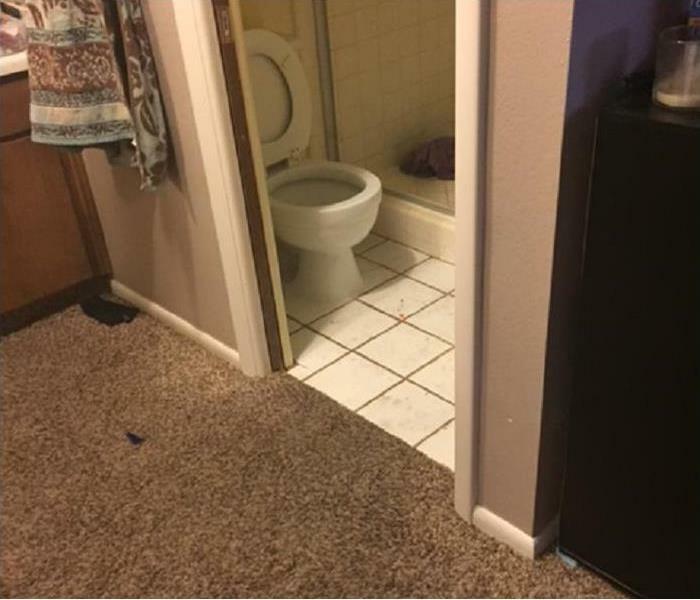 Even though most of the damage was in the bathroom, this room was also affected. Leaving moisture behind can cause other problems, such as mold. That's why we leave nothing to chance when checking for moisture. 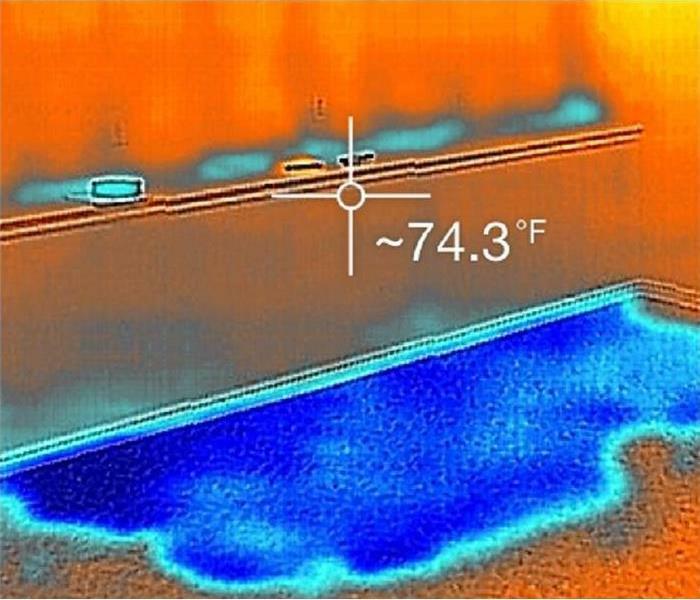 This FLIR Thermal Imaging system helps us to find all the moisture. The shower in the adjoining bathroom developed a leak that caused water to pool in the floor and affected the carpet in this bedroom as well. After the leak was repaired we cleaned up the moisture and repaired the damage. 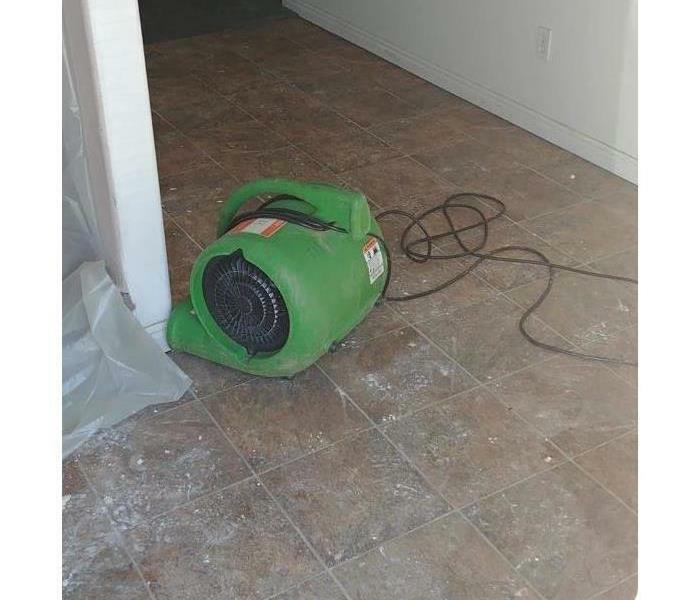 When this facility was flooded due to a pipe break, the owner needed a quick response. We came in and removed the carpet and affected drywall and removed all the excess moisture. Then we repaired the damage. 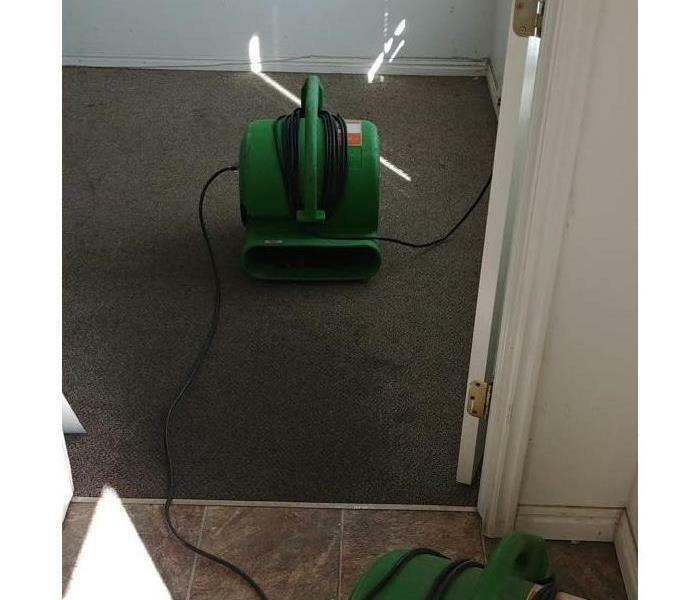 A pipe break in this home caused this carpet to become soaked with water. As you can see, we brought in equipment such as fans to help dry up the excess moisture before repairing the damage. We are always ready for any disaster. These fans and air scrubbers are ready to be loaded onto a truck to go to a storm job. When you have a storm loss, you need a fast response. We are faster to any size disaster. With severe storms, high winds can be a serious threat to your home. 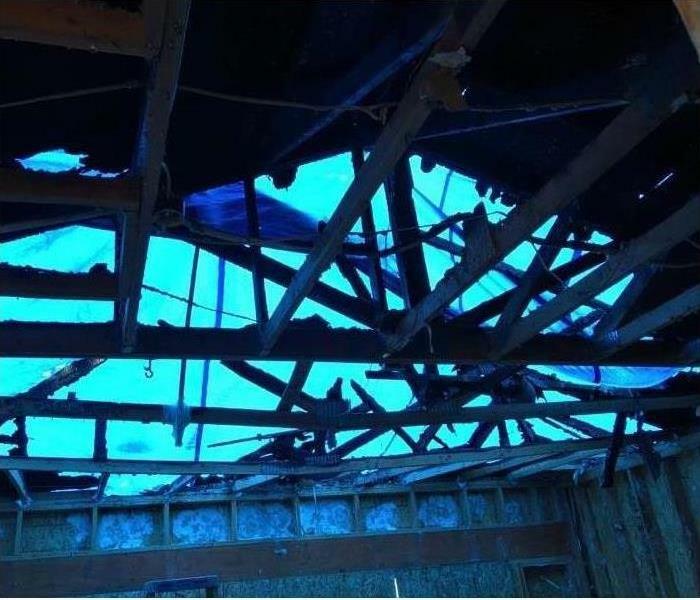 The home in this picture suffered a loss due to high winds from a storm that came through recently. If your home is damaged by high winds, give us a call. Storms that recently came through caused debris to block the drain outside this home allowing water to enter and flood this room. As you can see, there was still water standing in the floor when we arrived. High winds from storms can cause significant amounts of damage to your roof as you can see from this picture. This roof was heavily damaged and lost shingles and sheathing when storms recently came through the area. This home was a total loss when a fire tore through the interior. 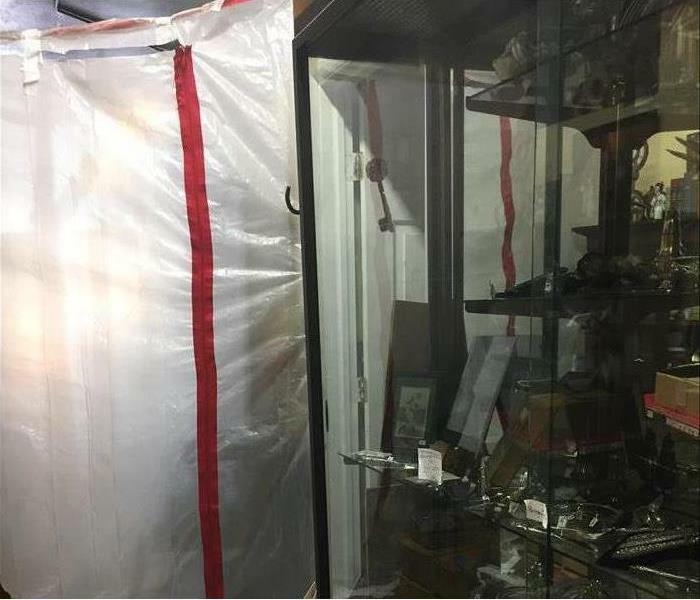 Some items were able to be salavaged. Fires are some of the worst disasters you can experience. If you have a fire loss, call us. 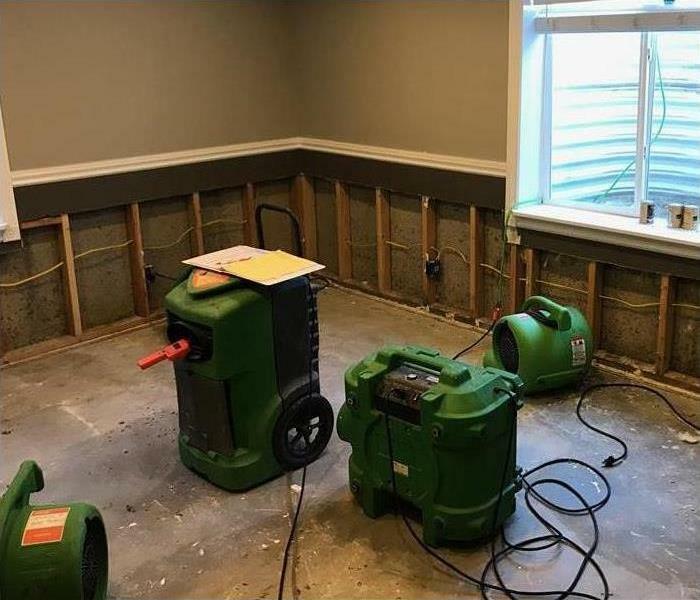 Water from flash floods entered this home and flooded this room. 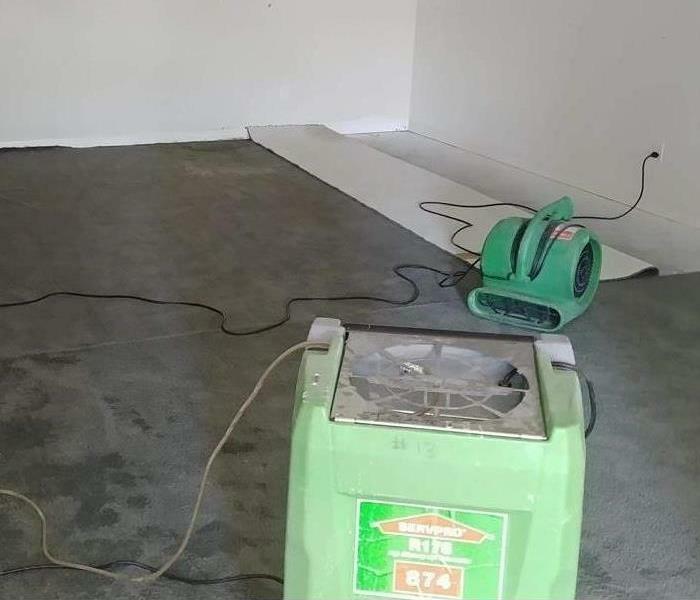 As you can see the carpet was soaked and the water also caused serious damage to the floors and walls elsewhere in the home. 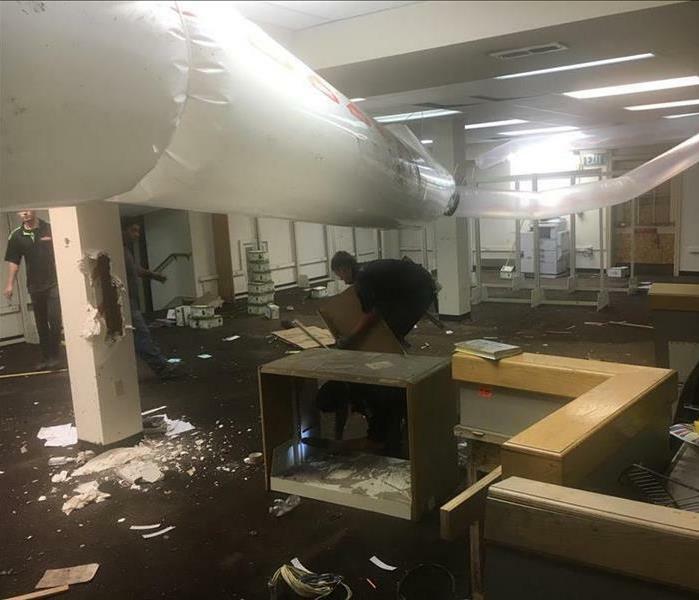 Our team was called to this library for a large flooding loss that happened from a lot of rain in a short period of time. We responded quickly and began extracting the water and removing affected content. 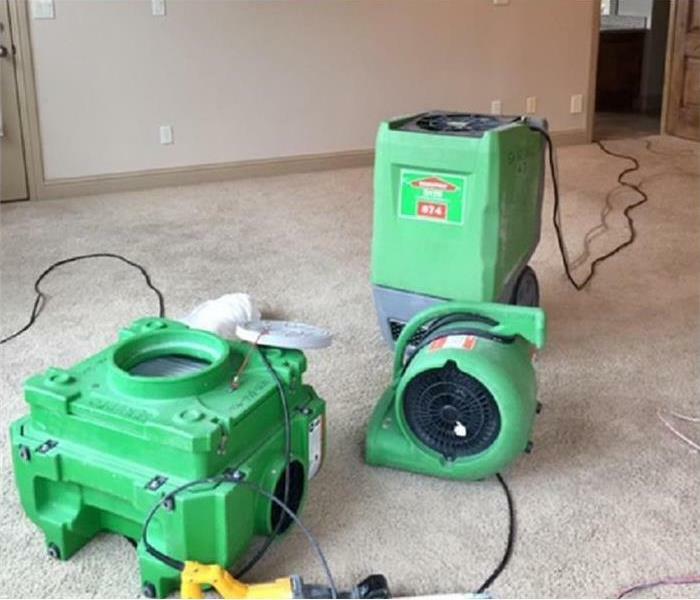 Here is our team responding to a water loss and cleaning the carpet that was severely damaged. We were quick to respond and begin the mitigation process. If you have any questions about our services, feel free to reach out at anytime.